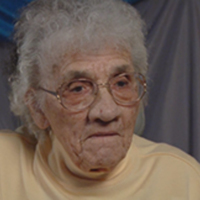 An interview with Emma Kleinknecht conducted as part of the Hanford Oral History Project. The Hanford Oral History Project was sponsored by the Mission Support Alliance and the United States Department of Energy. Robert Bauman: I'm conducting an oral history interview with Emma Larson Kleinknecht if I have the name right, correct? Bauman: And the spelling is K-L-E-I-N-K-N-E-C-H-T? Bauman: Excellent All right. Make sure we have the spelling right. Bauman: And today's date is June 12, 2013 and we're conducting the interview on the campus of Washington State University, Tri-Cities. And I'll be talking with Ms. Kleinknecht about her family's history, her experiences growing up in Richland, in that community. So let's just start, if I could, by asking you about your family. How, and why, and when did they come to this area? What brought them here, and any information about your family and why they came here would be great. Kleinknecht: Well, my dad came from Denmark. And he went up to Alaska and worked in the mines. And then he came down to Seattle, and after a while, he got interested in working with the cattle. So somehow or another he came over to Richland and met my mother over there, and she was single. And then he married her, and I was born 1918. Kleinknecht: No. She was born and raised on the coast. But she had relatives that lived over that way. Bauman: Do you know when your parents married? Kleinknecht: Oh, a couple years before I was born. Bauman: And how about any siblings? Are there any brothers or sisters? Kleinknecht: Oh yes. There were six, three girls and three boys. And then when I was eight years old, my dad came in the house, he says, "Emma, you've got to learn to milk cows." Because the girls were first, you know. So I went out and helped milk cows, or learned how. And from then on, I milked cows. But all of us had to go out and pitch hay to make hay for the cattle, and we put it on a big haystack. And there's a picture of that here. Bauman: So you had a place with lots of cattle? Do you have any idea how many cattle? Kleinknecht: Yeah, we had eight cows, two horses. Because in them days, you never had tractors, so you had to have horses, to do all the outdoor work like that. Bauman: And did you grow any crops? Kleinknecht: Oh yes! We raised everything by hand. We had corn, and tomatoes, and you name it. All the vegetables there were. Bauman: And were those primarily for your family? Kleinknecht: I think we had about 20 acres. We had a lot of asparagus, and us kids had to cut asparagus before the school bus came, or we didn't get to go to school. But we went to an old country school, where was one teacher, five grades. There's a picture of me in one of them pictures. Bauman: [LAUGHTER] And was this in Richland or? Kleinknecht: Old Richland, up north. Kleinknecht: We never got downtown for a while. It was really something. Kleinknecht: Five grades and one teacher. Bauman: And do you have any idea of around how many students that would've been? Kleinknecht: I used to know, but I forgot. [LAUGHTER] That was back when. Bauman: Yeah. And how long did you go to school there, then? Kleinknecht: I think I was in the fifth grade and then, about that time, we had a school bus that would take us downtown to the old schools. I called them old, because they're so different [LAUGHTER] now. Bauman: You have a photo you wanted me to show? Kleinknecht: Oh, yeah. This is the country school. Bauman: Okay, great. So it looks like there's maybe, what, 20 or 30? Bauman: Is there something like that? Kleinknecht: That's about right. I wrote it down there. Bauman: Yeah, 1925. Fruitvale School. Bauman: [LAUGHTER] And so--that's a great photo--After that, after, say, fifth grade, where did you go to school? Kleinknecht: There was a grade school and a high school down there. Bauman: I think you sent us some photos of you playing basketball, maybe? Kleinknecht: Oh yeah! That was downtown. That was a different kind of basketball. I was a side center. I'm the second one there. The tallest girl was the center, and then I was a side center because I was shortest. Then there were two guards, and two forwards. Bauman: Yeah, it says champion basketball. Kleinknecht: Yeah, that one is. Bauman: Yeah, 1935, '36. That's great. Do you remember how long you played? Did you play throughout high school then? Kleinknecht: Oh yeah. That's what this is. Bauman: Do you remember if there were other sports for girls to play in high school besides basketball? Kleinknecht: That's all we played, anyway. Bauman: So I assume the schools in downtown Richland were a little bigger? Kleinknecht: Oh, yeah. There were five grades in one building. Then we went over to the high school. And right by the high school was a Methodist Church and a Seven Day Adventist. Catholics all had to go downtown because there were no church. And so my dad found some building, and had to make a Lutheran church, because all Scandinavians were Lutherans. And that's where he came from. So we all became Lutherans. Bauman: [LAUGHTER] So you talked about that early school building, in Fruitvale, being used as a school building, a church, a grange. I was wondering about other social activities, or community activities that you might remember growing up. Were there Fourth of July celebrations, or community picnics or any of those sorts of things? Kleinknecht: Oh, I've kind of forgot, but I think that it could've been used for anything. But those other things were always the big things. Bauman: [LAUGHTER] So what sorts of things growing up did you do for fun? Did you do fishing, or did you go swimming in the river, or any of those sorts of things? Kleinknecht: Well, my dad, when we were little, would take us down at the river and get us swimming to get cleaned up, so we could go to church. [LAUGHTER] See, we weren't too far from that Columbia River where we used to live. But that was in the summertime. [LAUGHTER] So we were tickled to death to get to go down there and swim. Kleinknecht: Not when we went down there. This was only in the summer. Bauman: Yeah, sure. So the place where you grew up, in addition into a house, did you have a barn? Was there other buildings like an outhouse, anything like that? Kleinknecht: Oh yeah. We had outdoor toilets. Pumped our water out of wells, and when we milked the cow we had a separator, and had to separate the milk and get the cream. Yep, we had all them old things. Had to pump water for washing clothes, taking baths, and put water in big tea kettles so you could wash dishes. It was a different world then. Bauman: Did you have electricity at all? Kleinknecht: No. Not for years. Bauman: How long did you live there in that place? Kleinknecht: Gosh, I don't remember. It seems like my dad passed away, and my mom sold our house. And we moved over next to that school house. There was an old building there. And she still kept a few cows, and just had a garden, and like an orchard out in the fields. So after that, we were catching school buses. Bauman: When you were growing up, what might a typical day have been like for you as a young girl? Bauman: The things you might have done on a typical day as a young girl, growing up. Kleinknecht: Yeah. Well, I joined the 4H group. For one thing, and we really had a lot of fun. Learned how to sew, and cook, that's what 4Hs were in them days. I don't know if they still have them or not. Bauman: I believe they do, yeah. Kleinknecht: Do they? Yeah, those were the days. Then there's times we'd, a few of us neighbor kids, get together and walk down the river, and walk back up, and swing on swings. That was about the size of it. Bauman: I wonder if you remember anything--the Great Depression came along in 1929 or so, and I wonder if you remember, with the Depression, anything specific that had impacted your family, or the community in any way? Kleinknecht: No. I think because we raised everything we ate, my mom canned everything. And everything we had was from the ground. And none of us suffered from it. Because we had our own milk and those kind of things. Nope, them were the days. Kleinknecht: Oh, I was married then. I got married in '38. Kleinknecht: That was a bad thing. The government gave everybody a check. They didn't even know this was coming. And told them to get out, take everything you got and leave. So my mom went to Grandview. Some of them went up there, some went to Prosser, and a couple of them stayed there. But they all had to leave town and they went to Kennewick. Bauman: So your mother was still living on the same place at that time and she left and to Grandview? Kleinknecht: Yeah, I think they were, because I was the oldest one. Bauman: And so you said you got married in 1938? Bauman: And who was your husband? How did you meet? Kleinknecht: Umm, he was a friend of my sister's boyfriend. [LAUGHTER] That's how I met him. In fact, his folks they didn't live too far from where we built a big house and lived in there, on Westhood Avenue. Bauman: So you said that you moved to Kennewick, right? Bauman: [LAUGHTER] And what did your husband do? Kleinknecht: He was just a--oh, he was a farmer but afterwards, he worked out in Hanford in the fire department. Bauman: Do you know how long he was there or worked at the fire department? Kleinknecht: I'm trying to think. They let him go, and then he got sick and passed away. It was probably something from out in that area. But that's been several years ago. Bauman: And did you have irrigation at all? Kleinknecht: Oh yes! Oh, yes, not for the house, but for the fields. Oh yeah, we had K.I.D., just like they got now. Gary: Well sure. We've got her graduating class. Just--I'll hold it. Bauman: What year is-- You said you graduated high school in what year is that? Bauman: 1936. Graduating class of how many is that? Kleinknecht: 2, 4, 6, 8, 10, 11, 12, 13, 14, 15. Bauman: Graduating class of 15. Bauman: Was that Columbia high school? Bauman: The old Richland, right, sure. Richland, High. Then it became Columbia, the Columbia High, you're right. Kleinknecht: Yep. Two, four, five boys, and the rest are girls. Bauman: Did you stay in contact with a lot of your high school friends after? Kleinknecht: Oh after I graduated and got married we all kind of--then several years ago we had picnic lunches together, but that's been a while back. But not many of them are here anymore. Bauman: Do you remember any of your teachers from the high school? Kleinknecht: Oh, yeah. That basketball player, oh that guy there. In the middle, up there, Mr. Carmichael. Bauman: Oh, is that Mr. Carmichael? Bauman: Isn't that who the school was named after? Bauman: Was he a principal? Kleinknecht: Yep. He was a good guy. There was a grade school and a high school in downtown Richland. And that was-- I can't see the—193-what? Bauman: Yeah. Both are in 1935. Do you know where in Richland that would have been? Kleinknecht: Yeah. You know where John Dam's grocery store used to be? Kleinknecht: You don't know either, huh? Kleinknecht: I know where to pick them out. Gary: I know where the Amon Building is. Kleinknecht: Well, just back there a ways. Bauman: Mm-hm. Yeah, not a whole lot of other buildings there. Kleinknecht: No. I think there's a toilet in the back out there. Gary: Yeah, I would hope so. Bauman: Are there any things that you remember growing up or that really stand out to you that--memories you have, or things that you think would be really important for people to know about this place where you grew up that we haven't talked about yet? Kleinknecht: Well, they would never have realized how we made our living off the ground. Kids nowadays won't do that. Okay, here is us kids driving the horses. Because we had no tractors. Bauman: And that's you and a couple of your siblings? Bauman: And did you have the horses then the whole time you were growing up? You never got tractors? Kleinknecht: Well, when my dad was alive, we never had a tractor. And there's that one with the hay. Okay, that's how—Show them. Show them how the haystacks were. Gary: Can you talk about it? Kleinknecht: Yeah. I know us kids would get the hay in big stacks. Then we'd throw it up on this wagon. And then tie--they had a rope here and here, and then time we got down to the haystack, they'd tie that rope up above in there, and then pull it over. Roll it, that's how they got the hay in a big stack. Bauman: Sounds like a lot of work. Kleinknecht: It was. In the winter time, they'd take a great big canvas and cover the top of the hay, so it wouldn't get wet and ruined. That's how they fed the cattle and the horse. Bauman: I was going to ask you about any neighbors. Who were your closest neighbors, or did you have any really good friends when you were growing up that you remember? Kleinknecht: Oh, yeah. These are all--were my neighbors when I grew up. First grade. Bauman: Oh. Who are they? Gary: Tell them about them. Kleinknecht: Oh, okay. That's, the Kaas boy, I can't think of his name right now. He lived right down a ways. Bauman: It's at the bottom, Mom. Kleinknecht: Oh, did I write it there? Oh, Ed Kaas, yeah. Kleinknecht: And then Phillip Hempcry, right there and me, oh, and Carol Hansen. He's the little guy. But they're no relation. Yep. They all live not too far apart. Bauman: Right. In fact, I just talked to Gordon Kaas this morning. Kleinknecht: See, and then there was also another one. Started with an F. Oh, phooey. He lived down the Pole Line Road. There was an irrigation canal between the school and the other families' farms. Kleinknecht: We played all the time, yeah. Kleinknecht: Gee, I can't think of that name, and I know it like I do even mine. I'll think of it. Kleinknecht: [LAUGHTER] Oh! Yeah, my dad wanted to be baker. This is in Denmark. And his dad didn't want him to be a baker, so he and his cousin jumped something and come to the United States from Denmark. And that's how come he met my mom and that's how come I'm here. Bauman: So, did he come to the United States-- do you know why the United States, was it just for opportunity? Kleinknecht: Well, to get a good job. He wanted to maybe get to be a baker here. But he and his cousin, they went to Alaska. Then they come to Seattle and worked on a farm. And that's what got him interested. Bauman: That's interesting because Gordon Kaas said that--I was just talking to him this morning--his father is from Denmark. Kleinknecht: Well, I'll be darned! What was his name? Kleinknecht: Harold. I'll be darned. Bauman: So, I’m trying to think of any--I guess one other question to ask you is, So you were married in '38 and moved to Kennewick, and I was just gonna ask you about when--do you remember finding out about, for instance, about World War II? The Japanese attack on Pearl Harbor, do you remember any of that? Any memories about hearing about that? Kleinknecht: Pearl Harbor. I knew about it, and forgot about it. Who do I know about it? Gary: It's what started World War II. Bauman: That's all right. Another question, Did you have--How did you get news? Was there a newspaper or anything? Kleinknecht: Oh, yeah. Newspaper. When we were married, we had a little radio for a while, and then we got a TV. Bauman: But when you were growing up, it was a newspaper? Kleinknecht: Always. And a radio. Oh when I grew up, you never had televisions. I don't think anybody did. Gary: Do you wanna tell them about that? Kleinknecht: Oh. Well, this is my mother, and sisters and brothers, and there's the horse. [LAUGHTER] See, that's how we heated up our house, with wood. Bauman: What was the horse's name again? Kleinknecht: Prince, one was Prince and one was Henry. I think that was probably Henry, because Prince was a little fussier. And I don't think they would carry him out. Bauman: So the horses were obviously very important. Bauman: For doing a lot of the work on your place. Kleinknecht: Yep. Because we never had tractors. In fact, you couldn't afford to buy one if you did, if you would want one. Nope. Them were the days. Oh, yes, and here's my momma and my papa, and my two sisters. One of them's me. Bauman: Oh, you're the second? Okay. That's a great photo. Bauman: So that would've been some time in the 1920s, huh? Bauman: Do you know where-- You said she was living in Richland, right? Bauman: Do you know where her family came from? Kleinknecht: Oh, like, over on the coast. I was trying to think of the little name. Yelm. Kleinknecht: That's why she came over. I think she had a sister or an aunt or something. Nope, but I'll never forget our school days. Gary: We're getting kinda low on them. Gary: Do you wanna talk about--well, you've seen--No, that's the little kids. Kleinknecht: Oh, the grade school. Gary: Let me hold it, Mom. Kleinknecht: Just a minute, I gotta look at them. Oh, this is everybody in that school. Gary: That's your first grade. Kleinknecht: Yeah. 1925. That's my first grade, yeah, but that's the five grades. They all dressed alike in them days. Bauman: So if someone is to you, like, what sort of place Richland was like to grow up in, what would you--how would you describe it? What would you say to them? Bauman: Yeah. When you were growing up. Bauman: Did your brothers and sisters, stay in the area? Kleinknecht: I'm trying to think. Bauman: Or did they move elsewhere? Kleinknecht: I think they moved elsewhere. I know one went down to Oregon, and the other went up north further. And then my oldest brother was a heavy smoker. And he had to go pass away. I don't know where he ever got money to buy cigarettes, but he did. Bauman: Anything else about growing up here in Richland that you want to make sure we know about, or? Kleinknecht: Well, I just like the town, Old Richland. And then where there is a yellow building, like before you go down to the park, brick building, that used to be a two story building. And now it's only one. There was a John Dam store, and a Murray Hardware, and--oh, what do you call them? It'll come to me. Kleinknecht: Name some names, quick. Gary: Describe, what? Describe it. Gary: Yeah, describe it. What did they do there? Kleinknecht: Oh, like the shave and cut your hair. Bauman: Barbershop? Yeah. Was there a movie theater down at all? Kleinknecht: You had to come to Kennewick to go to a movie. [LAUGHTER] And they were cheap, ten cents. Cheap now, I don't know if it was cheap then. [LAUGHTER] My dad did take us kids to a movie once for a dime but it had to be a special. Kleinknecht: No, them old days. Right now they're good old days. Gary: Would you like me to prompt her? Gary: I can probably pull a story or two out. Gary: Okay. Did you guys have dances? Kleinknecht: In that school house. Gary: And did your parents participate? Kleinknecht: Oh, heavens, yes. This is the grange hall, after the meetings. My dad danced with every lady. But my mom wasn't dancing. So I asked her why? She said, "I'm a Sunday school girl." But she never learned to dance. Bauman: So she wasn't gonna dance. Kleinknecht: No. She's a Sunday school girl. Gary: Did your dad ever help you gals, or your brothers and sisters get out to go to dances? Kleinknecht: Yeah, we all went to the dances. Gary: But your mom didn't approve? Kleinknecht: She went along, but she didn't dance. But I'd learned to dance all kinds of dances. Gary: Do you remember when the last time you danced was? Gary: You did there too. Gary: It was your 90th birthday. Gary: Yeah. You danced with me. Kleinknecht: That's a couple years ago. Kleinknecht: [LAUGHTER] I forgot. Yeah, I love to dance. Bauman: So the dances were in that same building as the school and the church grange meetings, or were they different? Kleinknecht: As we grew up, they were in there. But as we got older and the bigger schools they didn't do it anymore. Kleinknecht: We all went downtown to the schools, because they were much better schools. More new, indoor toilets, drinking water, everything. Gary: Do you remember when your dad got sick eventually and died, do you remember any of the stories that go along with that? Kleinknecht: No. I know he passed away at home. Gary: Do you remember what he died of? Kleinknecht: I think it was his heart. Gary: It was, you called it, the yellow jaundice. Kleinknecht: Oh, I'd forgotten that. Yeah. That's been a while back. Bauman: I was gonna ask you, you and your siblings, were you all born at home? Kleinknecht: Yeah. Nope, doctors never come to your house in them days. You had to deliver them yourself. Nope, them were different days. Bauman: Any other stories you think we should talk about? Gary: Did it freeze in the winter? Bauman: Did you ever go ice skating on it? Kleinknecht: No. We stayed away from it. Bauman: I was also gonna ask you, I understand there was a ferry that would transport people across the river, is that right? Kleinknecht: Down south at Kennewick. It crossed over to Pasco. Bauman: And that's how people could get across. There weren't any bridges at the time? Kleinknecht: Yeah there was, but it was way down, like where it is now. But if you wanted to take the ferry over from Richland, you wouldn't have to drive clear down there. And we did. Gary: How about the Timmerman ferry? Do you remember that one? Gary: I think it was near the mouth of the Yakima, but I think it crossed the Columbia. Kleinknecht: Could be. I've heard the name. Gary: I'm not sure, it was before my time. Bauman: I think that might be right. I think that's what I heard. Kleinknecht: Well, that's the way the cookie crumbles. Bauman: [LAUGHTER] Well, I want to thank you for coming in today and sharing your memories. And the photos are great as well, those are terrific photos. Bauman: Oh yeah! It's very interesting stuff to hear about from people who lived here. Who know what was going on. Kleinknecht: People would never done what we did. [LAUGHTER] God. 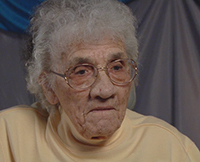 Hanford Oral History Project at Washington State University Tri-Cities, “Interview with Emma Kleinknecht,” Hanford History Project, accessed April 22, 2019, http://www.hanfordhistory.com/items/show/53.